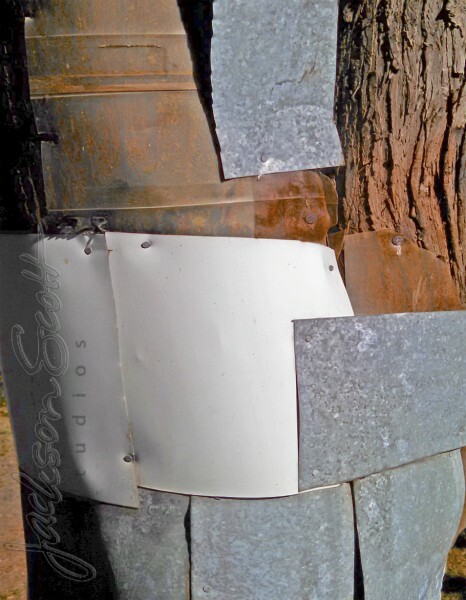 The weathered patina and multi-layered textures of simple metal scraps nailed to a tree. Everywhere I go I try to keep my eyes open for beauty in unexpected places. This past weekend, a family trip to Port Townsend, WA netted this beauty of a shot right outside my father-in-law’s front door. It was a bittersweet trip as my wife’s father recently sold the house, and it’s probably the last time we’ll visit him there. I’d passed this tree probably 100 times, and I had noticed the interesting patina of the metal on the cedar tree, but this time I paused to take the picture. I was struck by the realization that I had never take the time to do that before. The light was just right, and I think I got a beauty of a shot in a very ordinary place. I’m going to miss that old house. « The Tracks Cause Us Tears!